Don’t ask me why but when I was a child, growing up in Miami my parents didn't try and get me to believe in Santa Claus. Nevertheless, I find the “Yes Virginia There is a Santa Claus” story particularly appropriate for this post, which is about myths. One of the most effective marketing tools of medical aviation is the not-even-close-to-being-true concept of the Golden Hour. This myth is so successful, in fact that I hardly need to define it, but just to be safe, let me say simply that the Golden Hour is that all-important period when the ill or injured must be treated in order to have the best outcome. But Golden Hour has a squishy grounding in science. The Annals of Emergency Medicine published a report on this subject earlier this year which you can read here. But for a summary, let me quote Dr. John Morris, medical director of Vanderbilt University Medical Center’s LifeFlight program who explained recently that rapid access to medicine may be beneficial if a number of other factors are present. The type of injury and the overall health and age of the patient contribute to what Dr. Morris calls physiologic reserve. If your physiologic reserve is tapped out, you’ll want treatment in a hurry. But you can’t extrapolate that racing every accident victim to medical care in a helicopter improves outcome, ‘cuz it's just not true. Muddled thinking is how thousands of people like Oscar Vaz get taken for a ride. Or in his case it was his 12 year old daughter who got the ride, and he got the $16,000 bill. Oscar’s ‘tween was in a Texas summer camp in the community of Marble Falls this past June when she hit her head in the shower. The first responders felt the need to airlift the child to a hospital in Austin where the child’s minor injury was treated and she was released to continue her stay at camp. From his position as director of Vanderbilt’s LifeFlight program, here’s Dr. Morris’s take on the matter. Generally speaking in the United States, medical helicopters are operated in two different environments, aviation-based and medically-based. The aviation-based, for-profit companies have multi-million dollar balance sheets that entice Wall Street investors. These companies swoop into large population areas, strike up relationships with public safety agencies and get their phone numbers on the rapid dial of first responders. As Dr. Morris characterizes it, “speed is the most important product” that these air ambulance companies deliver. Hospital-based programs by contrast have no aviation expertise, “They focus on medicine rather than speed and rather than get the patient to hospital, they get the hospital to the patient,” Dr. Morris said. This means that the helicopter is more than a machine to move people. It is a portable medical suite, so that treatment begins at the scene. Then, even after the patient has arrived at the hospital and been tucked into a bed, the people responsible for determining the need for air transport are accountable for their decision. They learn from each patient so judgment improves with experience. The ability to follow up and learn is missing from the Vaz case. Private air ambulance companies have a temporary, entirely episodic involvement in the patient’s care. Lest this sound like I’ve drunk the Vanderbilt Kool Aid, let me say that Dr. Morris is not alone in the opinion that medically based programs are better for individual patients and public health policy. One might almost believe in the win-win, a private enterprise/public benefit scenario that Yale describes, if a few gnawing facts didn’t keep resurfacing. 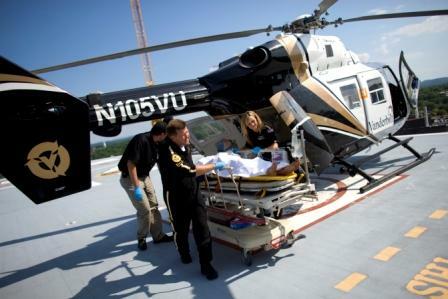 Helicopter ambulances are being used unnecessarily as often as half the time according to some studies. Patients are being put at risk because of the unabated safety crisis in medical helicopters. The only way to believe that critical mass in this industry is good news is to believe in the myth of the Golden Hour. And now you know Virginia, why this is a story the air ambulance industry won’t stop telling. You should ask Arizona why they have not put a stop the the Petroleum Helicopters "HALO" program. Ask the City of Glendale and Surprise how many patients they've flown for no reason just to keep the contract. Ask them why they have a lower level of care on board this helicopter than any other. Compare the number of flights from the City of Glendale and Surprise prior the HALO contract vs after the contract. This post is a mixed bag…partly true, partly not. When Dr. R. Adams Cowley first advanced the concept of “the golden hour” in Baltimore in the early 70’s, it was meant as just that – a concept. The theory was based partly on military data coming out of Vietnam (that showed better survival rates among severely injured soldiers who reached surgical care more quickly), and partly on physiological experiments with animal models that showed an inverse relationship between survival rates and time from injury to resuscitation. However, I don’t think there is any record of Dr. Cowley or any other scientist asserting that there is an actual, concrete, 60-minute long window that every trauma transport has to conform to. 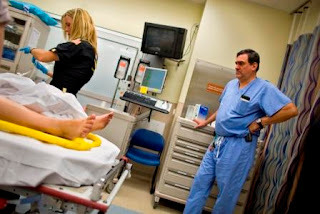 Rather, the “golden hour” was simply the slogan-ization of the sound idea that many severely injured patients would have the best chance at a positive outcome if the received the most expeditious transport possible, to the most appropriate care possible. If one wants to attack a concept that is completely unsubstantiated yet has been used to justify tens of thousands of grossly inappropriate helicopter transports, then look into “mechanism of injury”. The only time the “golden hour” concept is really useless and irresponsible is when it is combined with mechanism of injury as a justification for helicopter transport.